Ice Bear is a good role model. Why? Let us examine his many wise quotes to see. If you haven't noticed by now, ICe Bear has a lot of wise quotes to share with the world, and his brothers greatly appreciate him for it. He also likes to talk in the third person, which would be a mildly annoying trait for anyone who isn't an adorable polar bear. Now, your child can become his favorite character from the show We Bare Bears by wearing this Ice Bear costume for kids. This child Ice Bear costume is officially licensed from We Bare Bears, the hilarious animated series on Cartoon Network. The costume comes with a snow white jumpsuit that's covered in a soft faux fur material. It has the "Bear Stack" emblem embroidered onto the front. The final and most important detail to the costume is the attached hood, which is designed to look like Ice Bear's face! It has a plush nose and a pair of beady black eyes in front. It also has a pair of rounded ears on top. Looking for a great group costume for your child and his brothers? Why not dress them all up in costumes from We Bare Bears? 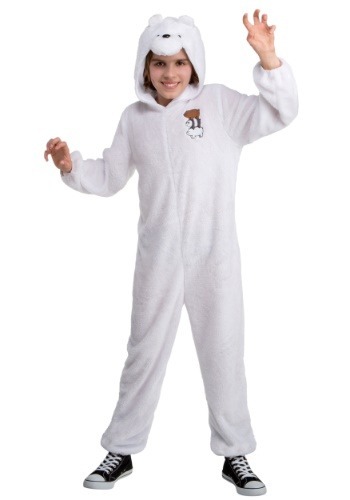 We carry Panda Bear and Grizz costumes to perfectly complement this Ice Bear costume for kids. Be sure to check them all out!